From ancient times, man has wanted to see things far smaller than could be perceived with the naked eye. Although the first use of a lens is a bit of a mystery, it’s now believed that use of lenses is more modern than previously thought. However, it has been known for over 2000 years that glass bends light. In the 2nd Century BC, Claudius Ptolemy described a stick appearing to bend in a pool of water, and accurately recorded the angles to within half a degree. He then very accurately calculated the refraction constant of water. During the 1st century AD (year 100), glass had been invented and the Romans were looking through the glass and testing it. They experimented with different shapes of clear glass and one of their samples was thick in the middle and thin on the edges. They discovered that if you held one of these “lenses” over an object, the object would look larger. These early lenses were called magnifiers or burning glasses. The word lens is actually derived from the Latin word lentil, as they were named because they resembled the shape of a lentil bean. At the same time, Seneca described actual magnification by a globe of water. “Letters, however small and indistinct, are seen enlarged and more clearly through a globe of glass filled with water.” The lenses were not used much until the end of the 13th century when spectacle makers were producing lenses to be worn as glasses. Then, around 1600, it was discovered that optical instruments could be made by combining lenses. The early simple “microscopes” which were only magnifying glasses had one power, usually about 6x – 10x. One thing that was very common and interesting to look at, were fleas and other tiny insects, hence these early magnifiers called “flea glasses”. Sometime, during the 1590’s, two Dutch spectacle makers, Zaccharias Janssen and his father Hans started experimenting with these lenses. They put several lenses in a tube and made a very important discovery. The object near the end of the tube appeared to be greatly enlarged, much larger than any simple magnifying glass could achieve by itself! Their first microscopes were more of a novelty than a scientific tool since maximum magnification was only around 9X and the images were somewhat blurry. Although no Jansen microscopes survived, an instrument made for Dutch royalty was described as being composed of “3 sliding tubes, measuring 18 inches long when fully extended, and two inches in diameter”. The microscope was said to have a magnification of 3x when fully closed, and 9x when fully extended. It was Antony Van Leeuwenhoek (1632-1723), a Dutch draper and scientist, and one of the pioneers of microscopy who in the late 17th century became the first man to make and use a real microscope. He made his own simple microscopes, which had a single lens and were hand-held. Van Leeuwenhoek achieved greater success than his contemporaries by developing ways to make superior lenses, grinding and polishing a small glass ball into a lens with a magnification of 270x, the finest known at that time (other microscopes of the time were lucky to achieve 50x magnification). He used this lens to make the world’s first practical microscope. Leeuwenhoek’s microscope used a single convex glass lens attached to a metal holder and was focused using screws. Anthony Leeuwenhoek became more involved in science and with his new improved microscope was able to see things that no man had ever seen before. He saw bacteria, yeast, blood cells and many tiny animals swimming about in a drop of water. People did not realize that magnification might reveal structures that had never been seen before – the idea that all life might be made up of tiny components unseen by the unaided eye was simply not even considered. To increase the power of a single-lens microscope, the focal length has to be reduced. However, a reduction in focal length necessitates a reduction of the lens diameter, and after a point, the lens becomes difficult to see through. To solve this problem, the compound microscope system was invented in the 17th century. This type of microscope incorporates more than one lens so that the image magnified by one lens can be further magnified by another. Today, the term “microscope” is generally used to refer to this type of compound microscope. In the compound microscope, the lens closer to the object to be viewed is referred to as the “objective”, while the lens closer to the eye is called the “eyepiece”. The function of any microscope is to enhance resolution. The microscope is used to create an enlarged view of an object such that we can observe details not otherwise possible with the human eye. Because of the enlargement, resolution is often confused with magnification, which refers to the size of an image. In general, the greater the magnification, the greater the resolution, but this is not always true. There are several practical limitations of lens design, which can result in increased magnification without increased resolution. The reason for a dichotomy between magnification and resolution is the ability of the human eye to see two objects. Englishman Robert Hooke is credited with the microscopic milestone of discovering the basic unit of all life, the cell. In the mid 17th century, Hooke saw a structural mesh while studying a sample of cork that reminded him of the small monastic rooms called cells (Micrographia). Hooke is also credited with being the first to use the basic three-lens configuration that is still used in microscopes today. All the early microscopists saw quite distorted images due to the low quality of the glass and imperfect shape of their lenses. Little was done to improve the microscope until the middle of the 19th century when great strides were made and quality instruments like today’s microscope emerged. Companies in Germany like Zeiss and an American company founded by Charles Spencer began producing fine optical instruments. We can also mention Ernst Abbe, who carried out a theoretical study of optical principles, and Otto Schott, who conducted research on optical glass. Chromatic aberration: the unequal bending of different colours of light that occur in a lens. This problem was first solved by Chester Hall in the 1730’s. He discovered that if he used a second lens of different shape and light bending properties he could realign the colours without losing all of the magnification of the first lens. Top – a photograph taken with a good quality lens. Bottom – a photograph taken with a wide angle lens showing visible chromatic aberration (especially at the dark edges on the right). Spherical aberration: the unequal bending of light that hits different parts of a lens. Joseph Jackson Lister solved this problem in 1830. He discovered that by putting lenses at precise distances from each other, the aberration from all but the first lens could be eliminated. Low power low curvature lenses could be made with minimal aberration and by using a lens of this type for the first in a series, the problem could be virtually eliminated. A perfect lens (top) focuses all incoming rays to a point on the optic axis. A real lens with spherical surfaces (bottom) suffers from spherical aberration: it focuses rays more tightly if they enter it far from the optic axis than if they enter closer to the axis. It therefore does not produce a perfect focal point. The third problem is that for a microscope, to be as good as physically possible, it must collect a cone of light that is as wide as possible. Ernst Abbe worked out the solution to this problem in the 1870’s. He determined the physical laws that govern the collection of light by an objective and maximised this collection by using water and oil immersion lenses. The maximum resolution that Abbe was able to achieve is about 10 times better than the resolution Leeuwenhoek had achieved about 100 years earlier. This resolution of 0.2 microns or 200 nanometers is a physical limit imposed by the wavelength of light. In recent times, the development of the microscope has slowed, since optical principles are well understood and to an extent, the optical limits have been reached. The majority of microscopes follow the same structural principles that describe monocular, mono-binocular and stereo-binocular microscopes. While the technical limits of design have been reached, Vision Engineering has taken the approach of developing the practical day-to-day user friendliness of the microscope. 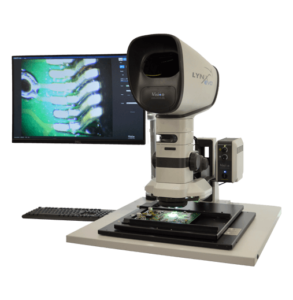 Vision Engineering’s patented Dynascope™ technology removes the need for conventional eyepieces by expanding the image exiting the eyepieces from 3mm, obtained using traditional microscopes, to 100mm. This has the major advantage of freedom of head and body movement for the operator. Practical implications include more efficient and easier use of quality microscope instruments in every application. At the heart of Vision Engineering’s patented technology lies a rotating multi-lenticular [multi-lens] disc, composed of millions of lenticules [lenses], which act as independent image forming surfaces with diameters of a few microns each. The disks spin at high speed to merge the millions of individual optical paths into an aberration-free, high-clarity image. The result is a system which has unrivalled levels of operator comfort, reducing fatigue and increasing quality and productivity.